This webinar explains the tools and resources that you can use to access open aid data. It is available in English and French, and the accompanying resources are available here. This animation explores the key reasons why aid transparency is so important. 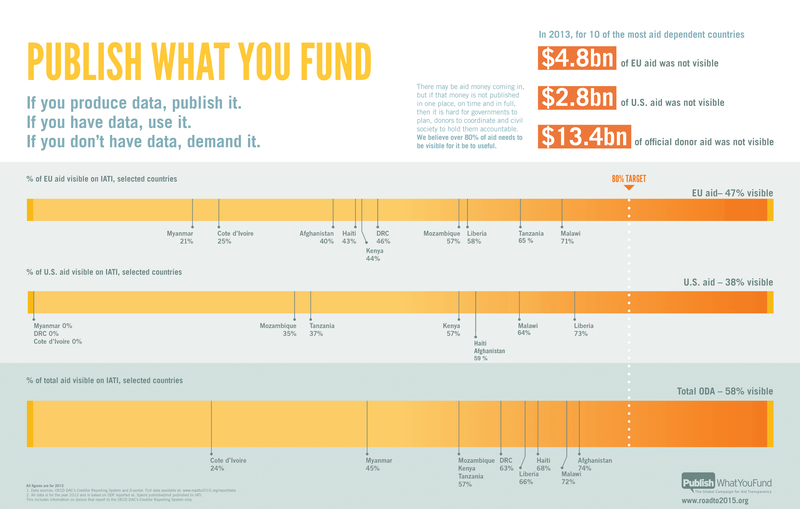 This infographic was produced for our 2015 Aid Transparency Reviews. It illustrates that challenge partner countries face when they do not have access to current aid and development information. Click on it in order to download it. This documentary film was made in partnership with Development Initiatives and AidData in 2015. This short documentary follows the journey of journalist Gyanu Sharma in Nepal, who understands that having access to data can help him create a better future for his son. He is one of a growing number of citizens and civil society groups globally who have a hunger for data because they understand its powerful potential for change. This video was originally created as part of our successful Make Aid Transparent campaign. We collected tens of thousands of signatures from all over the world demanding that donors publish what they fund. It contributed to the commitment at the Busan High-level Forum on Aid Effectiveness from donors to publish their information to IATI. It is an excellent explanation as to why transparency matters.